Exceeds API Service Categories for heavy-duty-diesel engine oil: CK-4, CJ-4, CI-4, CI-4 Plus and older. 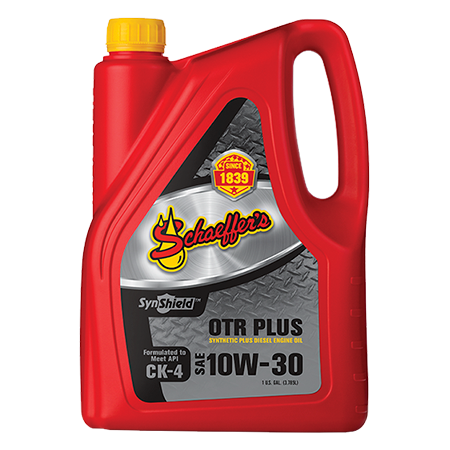 SynShield® OTR Plus 10W-30 Engine Oil is a premium advanced performance, synthetic plus, heavy-duty diesel engine oil formulated to provide maximum protection against wear, oxidation, deposit formation, soot contamination and aeration. SynShield® OTR Plus 10W-30 Engine Oil provides excellent fuel economy while maintaining engine durability and longevity. Using our proprietary friction modifiers, Micron Moly® and Penetro®, SynShield® OTR Plus 10W-30 Engine Oil creates a slippery, tenacious shield that prevents metal-to-metal contact for increased engine efficiency. SynShield® OTR Plus 10W-30 Engine Oil is suitable for use in 2007 and 2010 emission compliant engines that utilize heavy exhaust gas recirculation (EGR) and exhaust after-treatment devices such as diesel particulate filters (DPFs) with or without diesel oxidation catalysts (DOCs) and selective catalytic reduction (SCR). SynShield® OTR Plus 10W-30 Engine Oil can also be used in low-emission certified diesel engines that are equipped with EGR, older non-EGR containing diesel engines, and off-highway diesel engines. Improved wear protection – 71% less wear than conventional 10W-30 CJ-4 oils. High thermal and oxidative stability for greater resistance to viscosity thickening and the formation of deposits, sludge and varnish. Strong soot-busting, deposit-dispersing capability – 46% greater soot handling than conventional 10W-30 CJ-4 oils. Excellent shear stability for stay-in-grade performance throughout the oil drain interval. Superior low volatility characteristics to control oil consumption. Improved and optimized engine durability and reliability – especially for older model engines. Excellent protection against oil aeration and foaming. Excellent cold crank startability and low temperature pumpability.